One of the central themes in “Zootopia” is the relationship between predator and prey. In the city, the two live alongside each other in relative harmony — until they don’t. The explanation for how predator and prey live together is chalked up to evolution. Predators no longer need to eat prey because, gosh, they’re not barbarians. There might be discrimination, but at least lions aren’t eating gazelle for lunch. The animals are more, uh, humane than that. An earlier draft of the movie, though, had a different explanation. Here’s a storyboard version of a deleted scene that explains it all, as spotted by io9. 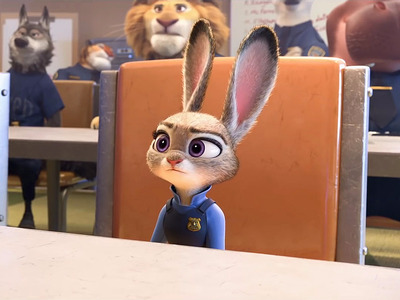 In this scene, Judy and Nick stumble into a “taming party,” where a polar bear gives his son a shock device that seems to activate whenever he has a predatory biological impulse. It’s the animal version of shock therapy. “It put us in a situation where, of course animals are biased against animals like Nick, against predators,” co-director Jared Bush said. “It makes sense, but it was very obvious.” So they cut the scene. And the world of “Zootopia” became a lot less horrifying.